Memory is one of the crucial components of any computer system. RAM or random access memory help processor store the virtual information about any running software or application as temporary information. But if you still need to increase your computers performance by just utilizing an external pen drive it is simply possible. By commanding processor to utilize the externally attached memory to function as virtual RAM, you can achieve this goal. Connect your Flash drive. Go to My computer > Right Click and open Properties. Go to Advanced System Settings > Advanced Tab > Settings Button in the Performance section. Again Click on Advanced tab > Virtual Memory Box and click on Change Button. Now, ‘Virtual Settings’ will appear > uncheck "Automatically manage page size feature". In custom size add your flash drive’s current available size. The best workaround is to keep the size just 10-20MB below than available size in a pen drive to safely avoid clashes. To view right click on the drive in my computer. This way your flash drive has now become Virtual Memory and certainly will boost your PC/laptop's performance. This is a pretty simple addition to Operating system by Microsoft. Select ‘Use this device’ option. Put almost 85% of your space from a drive in select space column by moving the scroll to the right. Click on ‘Apply’ button. Your flash drive will now serve as addition RAM to your PC, again if it is required to have that much extra load. To go back to normal mode again, just reset settings by selecting "Automatically Manage Paging Size". Usually, a good computer doesn't require additional RAM attached to perform faster. If your computer is lacking speed because of limited RAM and memory hungry applications, this trick will surely help. Again a normal Flash drive has a limited number of writes and hence cannot handle thousands of writes created by system cache to work as RAM, and hence the life of flash drive will be lowered considerably. Flash Drives are made to work on a normal day to day writes and if used with this trick, it will reach its lifespan write limits and die much early. If such flash drive is ejected while a machine is on, it will create a blue crash screen as RAM will stop suddenly. A system restart will be needed, still Vista or Win7 OS designs are stable and this method is safely workable at most of the cases. This trick works well for those who do not have the option to increase RAM or have lower configuration and need some RAM assistance to run necessary applications. 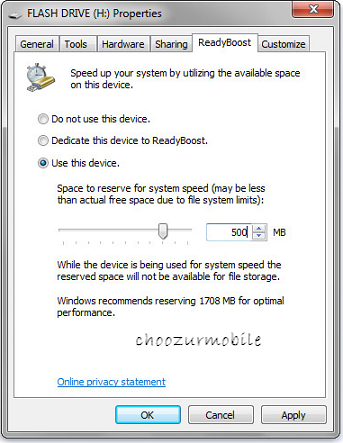 There is a program called as Eboostr which enables flash drive use as Virtual RAM with good results. Moving pagefile.sys file to separate disc location is always recommended by experts as accessing this file from the less busy disc will give best results by reducing pagefile fragmentation. For this, a separate disc will solve purpose and not just another partition. Mac and Linux users can do the same with equivalent "Swap" file.